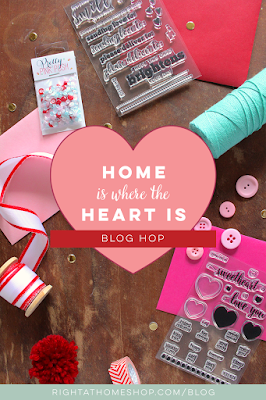 Hi everyone... Today is a fun Blog hop with Right at Home!! We are celebrating Valentine's Day with Nicole's Latest release. Be sure to read below for info on how to Win a special prize from Nicole. This release includes two new stamps sets and an exclusive Sequin Mix from Pretty Pink Posh. 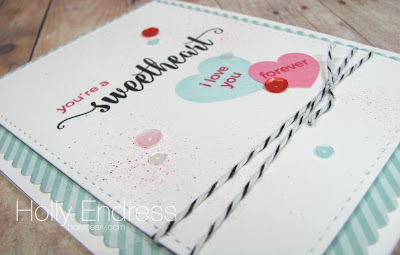 My first card using the new set Kiss Kiss along with the XOXO Sequin mix. I die cut a white panel and a pattern paper panel using some die cuts from Mama Elephant and then I stamped the images from Kiss Kiss using several different inks from various companies. Then I added some splatter to the background with a Distress maker and a spritzer tool. I tied a piece of Black Baker's Twine along the bottom and I adhered the panel to the pattern paper with some dimensional adhesive. Then I added the panel to a top folding White card base. I added several of the sequins from XOXO mix with some mini glue dots for a bit of bling. For my next card I'm using the sentiment from the new set Sending Love.. This set is perfect for decorating envelopes too! I started by creating a top folding Pink card base to coordinate with the pattern paper I was using and then I die cut the pattern panel using another fun Mama Elephant die. I die cut the box from some Kraft card stock and stamped a few of the hearts from the Kiss Kiss set and cut them out and adding them inside the box and adhered the box image to the center of the circle. 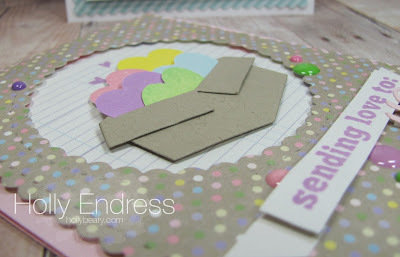 I stamped a few of the smaller hearts from the Sending Love set at the top of the boxed hearts as well. I stamped the sentiment from Sending Love onto a strip of paper and trimmed it into a banner. Then I die cut the You from a Winnie & Walter die using some Pink card stock and adhered both with dimensional adhesive. I wanted a bit more of the other colors from the paper so I added some enamel dots. Are you ready for the Hop.. Yuki is up next and you can see what she made here. And there are prizes for Hopping as well.. Be sure to leave a comment on each of the post in the Hop for a chance to win.. if you are just popping in you can start the Hop here with Nicole. Two beautiful cards Holly. 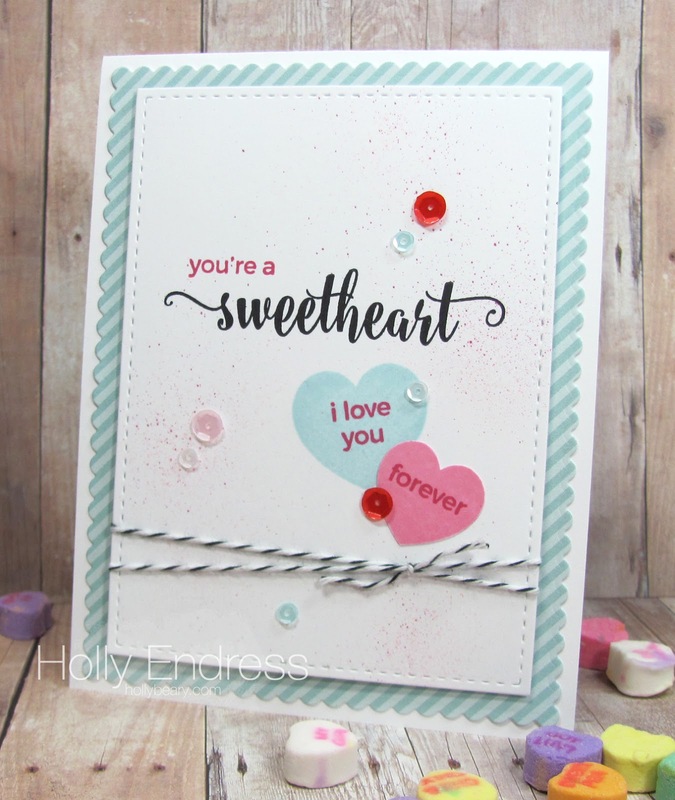 Love the colors on the first card - reminds me of a box of candy hearts! The second card with the box of hearts is adorable too! Love the color choices here! Amazing job! The box of hearts is super cute! Very fun cards! Great box filled with hearts, Holly! Super cute cards, love the new RAH stamp sets and PPP sequins!! So wonderful ! LOVE them !!! Both your cards are lovely! Totally awesome cards Holly!! You did a great job!! I'm so glad we are teammates. Your cards are so pretty! I especially love the boxes of hearts! I adore your lovely cards! Gorgeous neW release! Love these awesome stamps! Love you two fabulous cards! Loved the rainbow of hearts coming out of the box especially!! Great inspiration for Valentines as well as Anniversaries and other reasons of love! Love your cards, so fun!! !